Ruth Elder was born on 19 May 1907. She married Burley John Hickman, son of Melvin E. Hickman and Alpha Sponaugle. She died on 9 October 1990 at Elkins, WV., at age 83. Thomas Jefferson Mellon was born on 26 June 1852 at OH. He married Archena Hickman, daughter of Archibald Forest and Hulda Fogle. He died in 1907 at IL. [S2887] 1880 Hardin Co, OH. Census, Goshen Twp. Anna Burch was born in 1819 at NY. She was the daughter of Asa Chase Burch and Lucy Holley. She married David Rayner. She died from 1850 to 1853 at Cayuga Co, NY..
David Rayner was born in 1817 at NY. He married Anna Burch, daughter of Asa Chase Burch and Lucy Holley. He died on 19 August 1884 at NY. [S1670] 1860 Cayuga Co, NY. Census, Locke. [S2726] 1870 Cayuga Co, NY. Census, Locke. [S2729] 1880 Cayuga Co, NY. Census, Locke. David Rayner was born in 1848 at NY. He was the son of David Rayner and Anna Burch. He became a merchant in 1872. He was a shipper in 1900 at Genoa, Cayuga Co, NY.. He died on 16 January 1930 at Genoa, Cayuga Co, NY..
[S2898] 1900 Cayuga Co, NY. Census, Genoa. [S1088] Obituary ,Genoa Tribune, 24 Jan 1930. [S1461] 1880 Dallas Co, TX. Census. [S3463] Dallas Directory ,1878-79, boards with Lashley Renner, 1881 waiter at Union Depot. [S1280] 1930 Los Angeles, CA. Census, Pasadena. [S2150] 1910 Champaign Co, IL. Census, Champaign. [S4788] 1900 La Salle Co, IL. Census, Streator. Effie Daisy Shimp was born on 21 January 1877 at TX. She was the daughter of Orlando Shimp and Mary A. Renner. She married William Henry Atkinson in 1893. She died on 25 September 1941 at Dallas, TX., at age 64. [S1088] Obituary ,Dallas Morning News, Sept 1941. Eunice Heald was born on 20 April 1719 at Concord, MA.. She was the daughter of Lt. John Heald III and Mary Chandler. She died on 17 January 1795 at MA. at age 75. Howard Adelbert Volck was born on 26 October 1869 at MD. 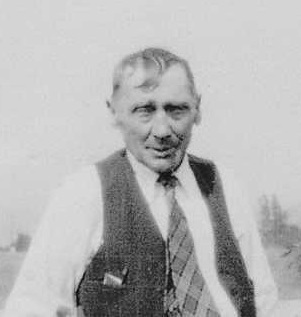 He worked for portland cement company in 1910 at Kansas City, MO.. He married Ruth M. Herron, daughter of James William Herron and Clara Ann Hickman, circa 1916. He was a farmer in 1920 at Jackson Co, MO.. He died on 28 December 1932 at Kansas City, MO., at age 63. [S1833] Pat Davis, e-mail to Howard Hickman, Jan 2008. [S2904] 1920 Jackson Co, MO. Census, Blue Twp. Giuseppe Angellotti was born at Italy. He purchased land in 1852 at Marin Co, CA.. He married Lois Francis "Fanny" Osgood, daughter of Isaac Smith Osgood and Lois Hibbert Stover, on 18 November 1860 at Marin Co, CA.. He died on 22 September 1883 at Guaymas, Mexcio. [S1882] New England Historical & Genealogical Register ,v. 74, p. 307. Frances Marion Angellotti was born on 4 September 1861 at San Rafael, Marin Co, CA.. He was the son of Giuseppe Angellotti and Lois Francis "Fanny" Osgood. He was Chief Justice of the California Supreme Court from 1915 to 1921. He died on 23 May 1932 at age 70. Carol Renner is the daughter of Guy Arthur Renner and Louise Lula (---). Anna V. Kempa was born on 29 March 1900 at Bohemia, Germany. She married Claude Raymond Sine, son of Franklin Chesney Sine and Elizabeth L. Wilson, on 10 July 1923 at Brooke Co, WV..4 She died on 20 September 1993 at Akron, OH., at age 93. [S3868] 1940 Ohio Co, WV. Census, Wheeling. Stella Florence Cunningham was born on 12 July 1879 at Harrison Co, WV.. She was the daughter of Jeremiah Blackburn Cunningham and Elizabeth Jane Pigott. She died on 2 March 1882 at Harrison Co, WV., at age 2. Ella Sabina Holmes was born on 30 August 1872 at Harrison Co, WV.. She married Cecil Warren Cunningham, son of Jeremiah Blackburn Cunningham and Elizabeth Jane Pigott, on 26 February 1896. She died on 2 January 1930 at Clarksburg, WV., at age 57. [S2907] 1910 Delta Co, CO. Census, Delta City. [S2103] 1900 Harrison Co, WV. Census, Union District. [S1352] 1920 Harrison Co, WV. Census, Union District. Marjorie Cunningham was born on 23 June 1898 at Harrison Co, WV.. She was the daughter of Cecil Warren Cunningham and Ella Sabina Holmes. She died on 30 December 1989 at Harrison Co, WV., at age 91. Vera Cunningham was born on 14 January 1900 at Harrison Co, WV.. She was the daughter of Cecil Warren Cunningham and Ella Sabina Holmes. She died on 11 October 1953 at Los Angeles Co, CA., at age 53.